This farm, with its mossy old barn, lies at the foot of the Olympic Mountains, a truly beautiful corner of America. After a short break I’m going to return to blogging with a change in focus. I’m getting away from photography tips and how-to for awhile. In all honesty I was beginning to think that most of what I could impart in terms of photography expertise I’d already set down in this blog. Search “Friday Foto Talk” in the blue bar at left to see how many articles I’ve posted (hint, it’s a lot!). Of course there is always more to relate, and the fact that I’ve been in a photo drought probably has the most to do with my waning interest in Foto Talk posts. What I will continue to do is feature some of my favorite images. I hope you enjoy them, and remember if you’re interested in hanging one or two on your wall or otherwise using any for other purposes, just contact me. I’ll be glad to quote a good price. Since the last election in this country I’ve been thinking often about rural America, in particular the ways in which it has changed. If you live in another country, or are a newcomer to the U.S., you probably became quite confused when we elected Donald Trump for president (someone I usually call “Mr. Pumpkinhead”). He obviously sold a bill of goods in order to get elected. In some ways that should come as no surprise. He is, if anything, an accomplished con artist. But it goes much deeper than that. I’ve traveled extensively through small-town America in recent years, and I’ve discovered that things have changed in significant ways. I did a similar amount of road-tripping in the 1980s, and while some things remain the same, a lot has changed. Of course I’ve changed a lot too. But it’s hard to deny what has happened over the past 40 years, and especially in the last decade or so. America is politically and culturally polarized to a great degree right now. This divide has always existed of course, but the degree of mutual distrust along with a general inability to find common ground, or even to simply speak to each other is unusual and disturbing. The divide doesn’t simply equate to city versus rural. Even within metropolitan areas, a divide exists between those living closer to the center and those in the outer suburbs and bedroom communities. This last factor had much to do with D.T. being elected president. Without those suburban voters he would have never won. There simply are far too few people in truly rural areas of this country to get anybody elected president on their own. This old mill and accompanying covered bridge lies in eastern Missouri and is protected as part of a historic district. In general the more liberal Americans live in cities and (more extensively) on both coasts. The rural west, the southeast and (with a few notable exceptions, California being a big one), outer suburbia throughout the country is where conservatives are concentrated. But today’s conservatism would be unrecognizable to conservatives of just a few generations ago. Mr. Pumpkinhead was no conservative before he decided to run for president, and it was only as the campaign ran along, and especially now that he’s in office, that he played chameleon. He is now a prisoner of stronger forces than he in the legislative branch and among the super-rich. Politics, however, is not where I want to go in this blog series. I find the nature of people and their communities to be of much more interest. Rural America has traditionally been a place where people move at a slower pace; where they are more trusting and welcoming of others, including travellers and strangers. In that way it is not much different than any other country. For instance if you’re French or have traveled much in France, try to say with a straight face that Parisians are as friendly and easy to get along with as the people of the countryside along the northern flanks of the Pyrenees. I’ve said enough to serve as an introduction. Next time let’s dive into the details and look at different parts of rural America and the important ways in which they have changed over the years. I hope you get away from work and responsibilities this weekend to have some fun. Thanks for reading and happy shooting! The rural Willamette Valley of Oregon was the destination of pioneers who journeyed the Oregon Trail in the1800s. I’ve been working on the southern Great Plains lately away from my beloved Oregon. I don’t know why I miss home more now. After all, I’ve been here in Oklahoma for no longer than I’ve been away on my long photo safaris of the recent past. But I do miss home. That’s why I”m writing this post at the airport waiting for my flight. I have about a week and a half off so I decided on the spur of the moment to cash in frequent flyer miles and fly back to the Northwest. I need a break from the monotony of treeless plains and fields, from a river-less place that gets its water from an enormous underground store created by rains of the distant past. The Ogallala Aquifer is one of the largest of its kind in the world and has supported the American bread basket for generations. Now of course it’s being “mined”. We’re steadily depleting it, forcing us to continuously lengthen our straws, drilling deeper and deeper for precious water. I’m posting a few photos from an old farm that I passed on the long highway that runs the length of the Oklahoma panhandle. This stretch of loneliness juts westward between Kansas and Colorado on the north, the bulk of Texas to the south. It seems as if it takes forever to drive far enough west to leave Oklahoma, either continuing west to New Mexico or north into Colorado. The highway never strays. It points west like an arrow. It’s inevitable that you pass or parallel a few historic pathways. One is the old Santa Fe Trail. Kit Carson and countless others rode horses over this trail in that golden time of westward expansion in America. But this series of photos speaks to a more recent time. Although the farm was abandoned sometime in the 1960s judging from the vehicles left behind, it very likely was used in the decades before that. Maybe even during the wet years before the dust bowl swept through in the 1930s. John Steinbeck’s novel The Grapes of Wrath documents the lives of those hard-working souls who left Oklahoma during the dust bowl and traveled to California in search of work. These are the kind of people who built this country. The story of westward expansion has fascinated me for a long time. It was the first historical writing that I devoured while still quite young. At least by choice; I don’t count anything I was forced to read in school. It was a warm late afternoon with very sparse traffic on the two-lane highway. A few flies buzzed around the old buildings and automobiles. The old windmill had been stripped long ago by relentless winds. On that day the wind was calm. Heeding the warming someone had painted on a door (see picture), I didn’t go into any of the buildings. I just walked around shooting pictures, stopping to picture children playing in the yard, a weather-beaten woman hanging laundry. A man bouncing to a stop in one of those old pickups, drunk on moonshine. I wonder why they left? Was it one of the droughts that routinely plague this region? Too many failed crops of corn? Did they just up and move to California one day? Did they start over from zero? I look and wonder. Did they miss home? Now it’s time for me to go home! across the foothills west of Mount Hood in Oregon. A quick break from the Africa roundup to say how great this place is, a stunning viewpoint not far from my house: Larch Mountain. It is an enormous extinct volcano that is easily visible from Portland, but often goes overlooked. People generally underestimate shield volcanoes, but they are Earth’s (and the solar system’s) largest mountains. This particular shield volcano is only of average size, but it is still a very broad, 6000-foot mountain that takes up a lot of space. They are made from basalt, which because it is a very dense lava, and very fluid when it flows, forces the volcano to spread out as it forms. The largest one on Earth makes up most of the island of Hawaii, and the biggest one in the solar system is Olympus Mons on Mars. Lying as it does above the western end of the Columbia River Gorge, and with a paved road to the very top, it is easy to drive up there (takes about 40 minutes from east Portland) for a sunset view. 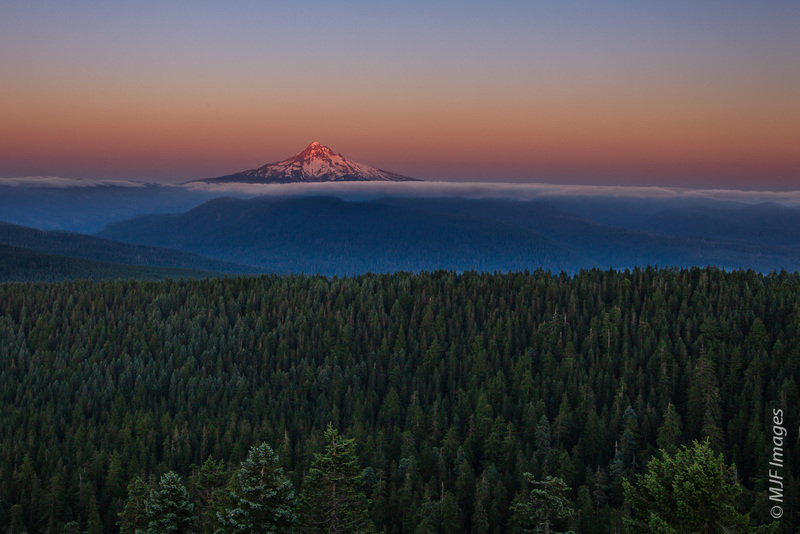 The top of the peak has a 365 degree view, including the in-your-face view of Mt Hood (above). It also allows you to look down the Columbia River towards Portland, as the sun sets in the west (below). I saw a total of 5 other volcanoes from the summit of Larch: Mount Hood (Oregon’s highest), Mounts Rainier, St Helens and Adams in Washington, and Mt Jefferson in Oregon. These stratovolcanoes are steeper, more spectacular, but ultimately smaller (in terms of volume) than shield volcanoes. 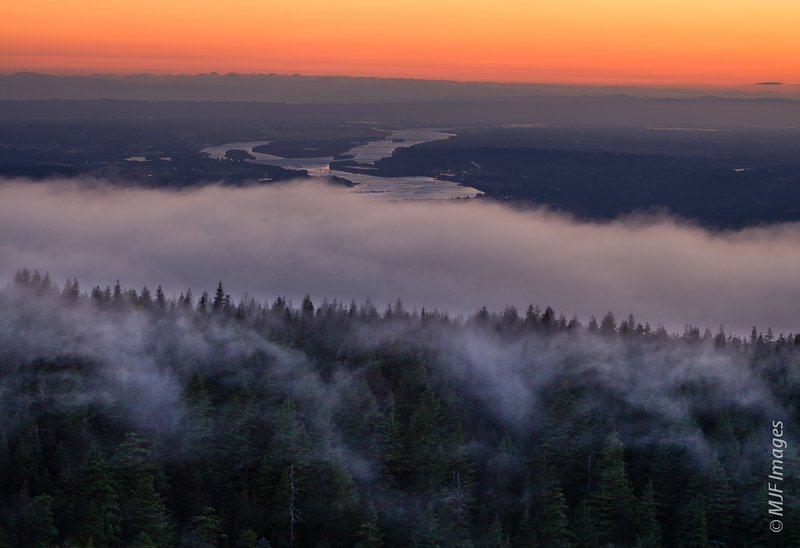 The Columbia River flows west below the foggy forests of the western Cascades in Oregon. It was a chilly motorcycle ride back down after photographing at the summit last night. The Pacific Northwest has had a very cool spring and summer thus far, while the rest of the country bakes in the heat. Today again it is gorgeous, sunny and in the 70s, with a nice breeze. So I will end this short post and get back to Africa tomorrow.